Notes and adornments may be set to use differently shape icons in Map view, i.e. other than the normal rectangle. Whilst adornments can use shapes, if using shapes it may be necessary to use a $NameColor setting other than 'automatic'. The shape of a note is determined by its $Shape attribute, and is inherited from its prototype (shape name values are case-sensitive). The $Shape submenu of the Note menu lets you change the note's shape conveniently. 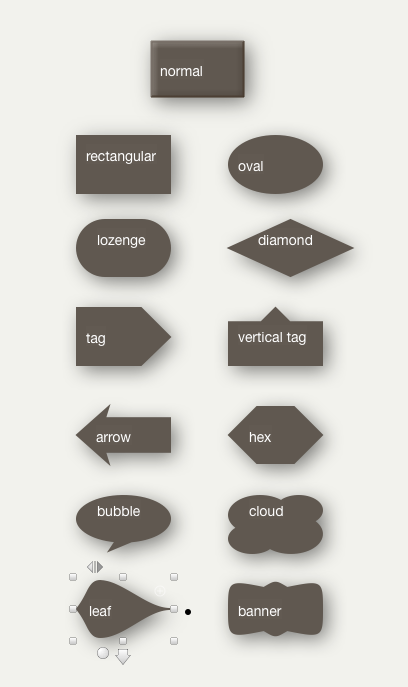 Shapes are still used for notes displayed in the viewport of an agent or container. The shape of agents and containers is fixed; they ignore the $Shape attribute if it is set by the user. Thus a visible shape can only be set for a note with no children. With the exception of 'cloud' and 'bubble' shapes can be transparent and have borders; 'cloud' and bubble' have no border if made transparent. Shapes are probably best reserved for special occasions/purposes, in order to emphasise exceptional or unusual notes. Otherwise, maps may become a little busy. Notes with non-rectangular shapes may now use the bar, vbar, pie, and ring progress-bar patterns.